‘I would say our style is ‘mixed period’ and autobiographical’ says Sydney born Sarah Jagger who is a fashion makeup artist, beauty writer and resident makeup expert for ITV’s This Morning. Sarah and husband Dominic Ingham, who runs his own property development business, tend to buy something from everywhere they travel; adding layers of personality and style over the years. ‘We like to think of it as a museum of our life journey’, muses Sarah. This idiosyncratic decoration imbues the house with a sense of playfulness. ‘I like quirky art and giant props like oversized books and glassware, they give the place an Alice in Wonderland feel.’ She says about the 20th Century Edwardian terraced house in Battersea. It was Dominic that found the house with his talent for sniffing out a great property. ‘We both loved the place immediately and although it obviously needed a lot of work there was a lovely feel to it’, says Sarah. Both remember having ‘an instant connection to the place’, and with the property’s original details restored to their full glory, it is easy to see how Sarah and Dominic fell for it. The house is perfect for the couple’s summer evening parties too, particularly the open-plan kitchen. ‘We have a big mirror ball, which we put in the hallway and if we fold the doors back in the kitchen we can extend the party into the garden’, says Sarah. When they moved in the property required a good deal of work, including the removal of a bomb shelter, camouflaged under the turfed back garden, which had been taken over by a family of foxes. With the house untouched since the 1940s, the couple were faced with peeling lino, threadbare carpets and boarded up fireplaces covered with ghastly electric heaters. But the house also offered some hidden treasures: behind the electric heaters and boarded up fireplaces stood art deco grates, and beneath the old orange carpet lay original Victorian tiles in immaculate condition. The obvious place for Dominic to start was to knock through the three tiny rooms on the ground floor, at the rear of the house. This could now create a more practical and family-friendly space, especially since the arrival of baby Freddy. Coming from a family of restaurateurs Sarah immediately loved Dominic’s idea to open up the kitchen. Allowing the house to be its own inspiration is a motto for Dominic, explaining ‘We wanted to keep the structural integrity of the building yet make it a functional space for family living as well as great parties’. ‘We spend most of our time in the kitchen, with so many pockets of space the three of us can all do our own thing, and do it together’, says Sarah. A simple day with home cooking is Sarah’s favourite with Dom reading the paper on the sofa, Freddie playing on the floor and limitless amounts of The Stones, Blondie and Bowie playing in the background. 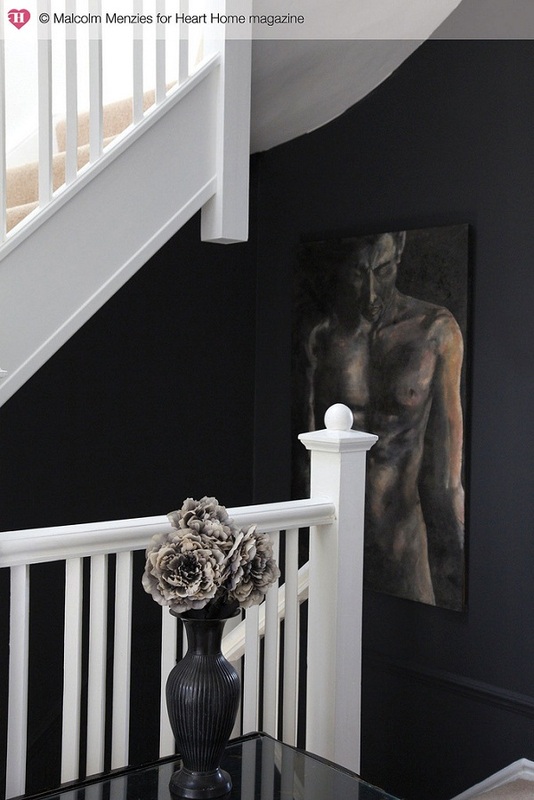 The most recent decorating project has been the strikingly stylish hallway and bedroom, now painted black. To avoid the space feeling too dark, Sarah has painted the woodwork bright white, which lifts it perfectly. And to keep costs down Sarah and Dominic rolled up their sleeves and painted it themselves... with a little help from a professional for the finish. Find out more about Sarah’s work at sarahjagger.com. 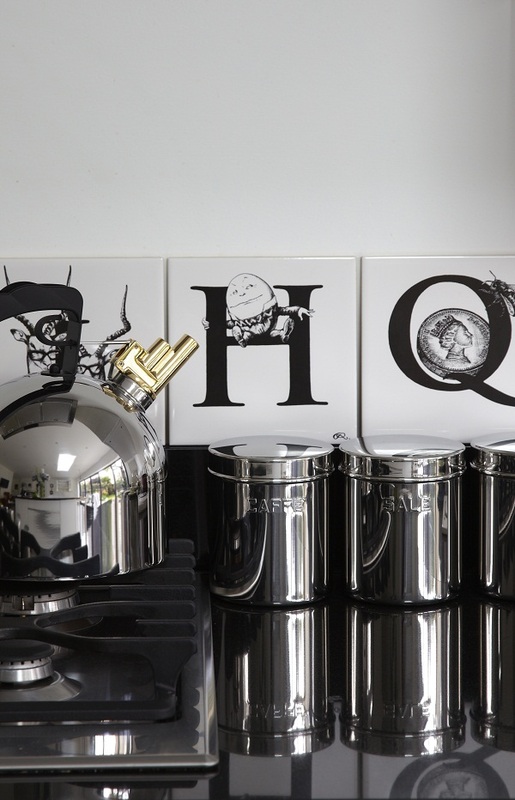 This feature originally appeared in the Autumn 2012 issue of Heart Home mag. Photographs by Malcolm Menzies. Words by Lucy Bloomfield.